This is a stylized Abstract Art, printed on paper, laminated with fresco finish and mounted on MDF. It is beautifully vrafted withing a green plastic moulding frame. The artwork has uses natural looking colors. It has a rich texture that will enhance space. The artwork is mounted on solid MDF with green plastic frame. It has one saw tooth hanger and depth of 1.00 inch. Made in Canada, it is packaged with care and is shipped to you, ready to hang on your wall. Brought to you by ArtMaison Canada. Transform a blank interior wall into an eye-catching focal point with this modern painting on canvas. Soft watercolour shades of blue and green provide the subtle background for a dramatic starburst of gold, radiating from the center of the canvas. A thin gold polystyrene frame surrounds the painting with subtle metallic glamour. Soft shades of blue and gray define both water and air in this traditional landscape painting. Using the same colour palette for both elements, the artist offers impressions of two opposing elements moving toward the same horizon line. Silhouettes of the landscape are reflected in the surface of the water while the creeping shoreline and barren branches evoke the feeling of a great river on the verge of a winter freeze. 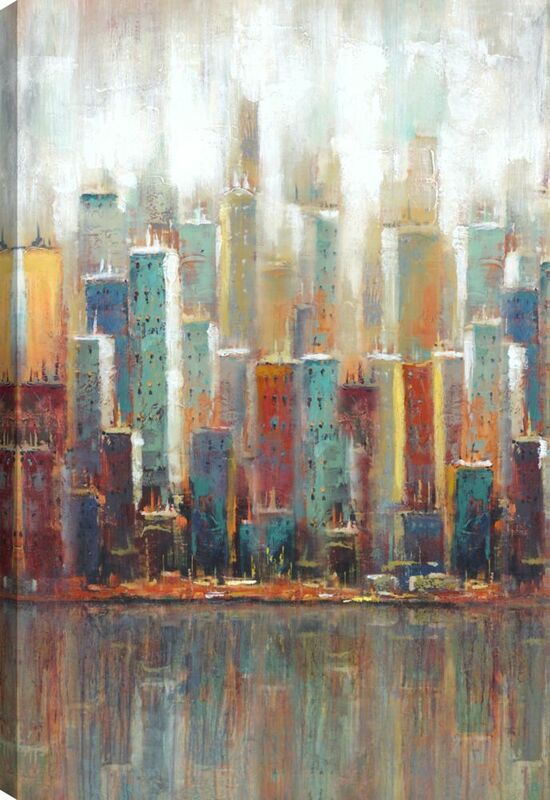 Cityscape II, Landscape Art, Canvas Print Wall Art This is a beautiful canvas print wall art. It has a rich texture that will enhance space. The artwork is stretched on solid MDF and is unframed. It has one saw tooth hanger and depth of 1.5 inch. Made in Canada, it is packaged with care and is shipped to you, ready to hang on your wall. Brought to you by ArtMaison Canada.